South Jersey / Atlantic City Golf Vacations is what we do and no one does it better! Explore the combination of more than 25 hotels, casinos, condos and seashore homes along with 20 championship golf courses. Enjoy Atlantic City's exciting nightlife, fabulous restaurants and hot casino action at night and play our fantastic golf courses during the day. We make planning your next Atlantic City Golf Vacation as easy as 1-2-3. Our website has the tools to assist you in choosing your custom All Inclusive Atlantic City golf vacation package including digital photos, virtual maps and accurate, up to date descriptions and much more. Our interactive website allows you to create your own discount golf package using our FREE TRIP QUOTE system. You'll receive an instant price quote online and you can email it to you friends. When you're ready to book your custom Atlantic City golf package, you can do it online or by calling an experienced Atlantic City golf travel specialist Toll Free at 1-877-465-3682. We're the only local golf vacation planner located in Atlantic City, NJ so you can be assured that we know the best places to Stay and Play! 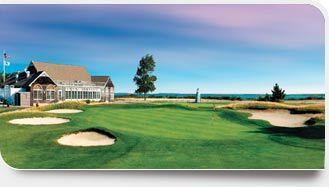 We're looking forward to helping you plan the best South Jersey golf vacation ever, have fun and enjoy our championship golf courses.